There are thousands of women in the MOA, and this blog exists to give them a voice. Thanks to all who submit their entries! 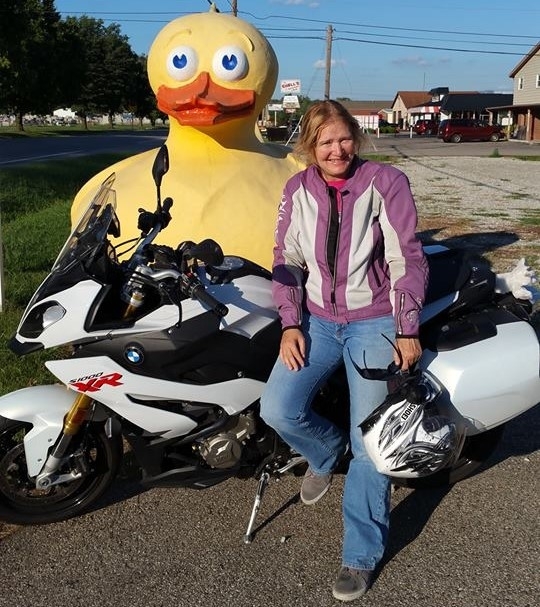 You can reach us on Facebook or by sending an email to submissions@bmwmoa.org with the subject "Women of the MOA blog submission." Please send photos in JPG or PNG format and words as a Word document or text file. "I can’t believe you allow him on a motorcycle!" said someone I'd just met. "Aren’t you worried?" I'm his mother, so of course I had concerns. On the other hand, since he was three, we could see the writing on the wall and shortly after this third birthday, we removed the training wheels from his bicycle. They were interfering with his ability to ride. 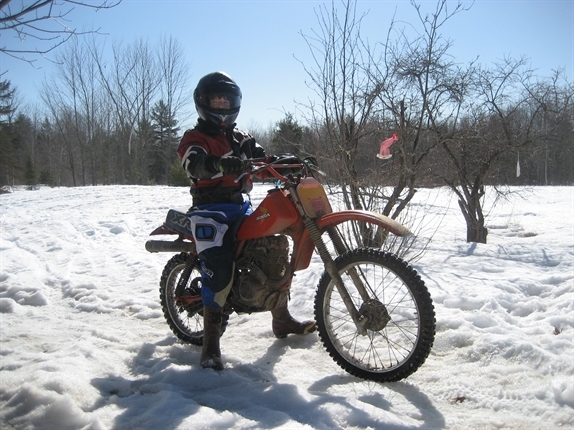 A few years later, when he was about 11, we caught him in the barn with one of the old dirt bikes. Knowing he wasn’t allowed to sit our motorcycles until his feet could touch the ground, he’d taken the situation into his own hands. Tools, bolts and both shocks were strewn about on the floor as he worked to fit flat, short pieces of metal he had fabricated himself onto the original shock fittings. His idea was to shorten the distance between seat and wheels, and hopefully drop the bike's height to the required inseam status. Though we appreciated his determination and ingenuity, he was told to remove his modifications. Because his dad rides dirt bikes for fun and a street bike whenever he can, there was no getting around it. Our son had the fever. Being the parent more worried about the potential dangers of letting our son ride a two-wheeled motorized machine, I debated my options. I could divorce my husband and forbid the children from riding motorcycles. After further thought, this option was dismissed because of my love for my partner and the realization that he would probably allow them to ride anyway. I could put my foot down and make the kid wait to purchase his first bike when he was an adult. 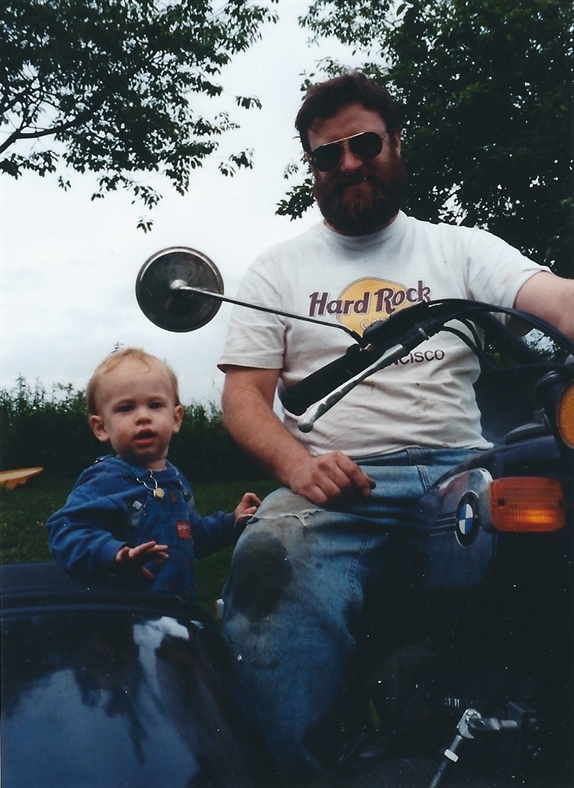 I realized that except for rides in the sidecar or behind his father, he wouldn't have any experience when he finally bought his first bike. The final option would be allowing him to begin riding on the dirt bikes we have here at home. This way, we could enforce the use of safety equipment, supervise where the bike was ridden around our home and provide the opportunity to master the machine via small, single-person tumbles on a vehicle suited for scratches and dents. We believed skidding through sand at the dirt pit and negotiating unexpected logs and bogs in the woods would make him a better road rider in the future. 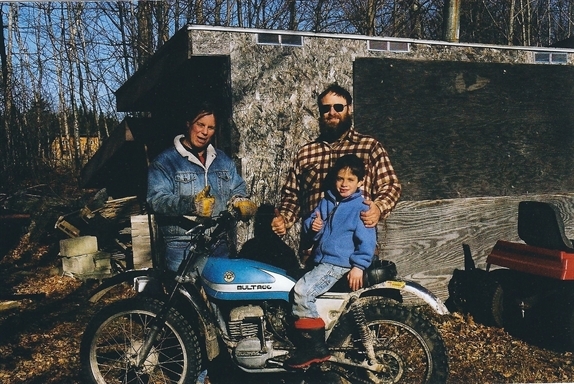 Eventually, we chose option three and sooner than I expected, my husband came home with a small dirt bike. The kid took to the saddle and has never looked back. We’ve prepared him for the asphalt as best we can and so far, he's walked away from minor incidents including a missed turn into the swamp and an evening date with a deer. At least those are the ones he’s told us about. Crashes have revealed themselves through his pain and trauma and the cost of damage repair. Last but not least, he attends bike safety courses, reads motorcycle articles and rides with an excellent teacher - his dad. Not long ago on a lovely July afternoon when the kid was 15 years old, his younger sister and I watched him and his dad ride away. Boys and bikes were packed for a month-long trip with friends through the southeast. Knowing what I did about their riding experience and skill, was I worried? Yeah I was, but just a little! I had a BMW F 800 GS sitting in our garage. It was January 2014, in Maryland, not a great time to venture out on a motorcycle. I planned to read Keith Code and Lee Parks and go to a motorcycle show at the fairgrounds, but mostly I dreamed. I would go out to the garage, sit on her, talk to her, talk to my son. Tom's Mom's Ride was born. That is what I would call my charity ride to honor my son. I needed to start riding. We did have a couple of riding days in January, close to 50 degrees. On one of those days, I dropped my bike three times; leaving the garage, at the stop sign at the end of the little road that I live on, and again 100 feet later because I couldn’t make a sharp enough turn. I was close to tears. Did I really think I could ride this bike across our country? I’m insane, I can’t even get 20 miles without falling. I needed to breathe. I got my bike up - I could do that - thanks to YouTube and my husband, who made me a pull-strap of webbing that gave me a little more leverage when my back was leaned into the seat. I headed to the parking lot of our local community college, where I took my basic motorcycle safety course many years ago. I practiced slow turns, stops, panic stops, figure-eights, relaxing my shoulders, relaxing my grip, breathing. I didn’t drop her once. The next weekend I met my ex-brother-in-law and two friends to do some riding around Prettyboy Reservoir. They were experienced road riders and very patient with me. Still, I was not comfortable. I was nervous going into corners. I was nervous every time I passed a car waiting to make a left out of a side road. My left thumb perpetually hovered over my horn. I returned home that afternoon determined to fix some things. I called Kyle McGill and Todd Dibell at Battley Cycles and asked if they could recommend a riding workshop. They recommended a couple and I went to their websites to see what resonated. Jim Ford’s Rider’s Workshop - The Art of Riding Smooth looked like what I needed. I filled out the questionnaire and hit send. This particular workshop wasn’t until April, but he called me shortly after I signed up and gave me some things to work on before the workshop. Jim told me to research my engine specs, learn what the value of max torque was for my engine, and then he gave me a formula to find the sweet spot for my engine, the place where it was most obedient. Then he told me to get out and ride, to get to know the elevation changes on routes 77 and 550 in the Catoctin Mountains. I loved the advice and I took it. Then I had to figure out what to do with the height of my seat. At 34.6 inches, It was too tall for me. I’m not a short woman (5’7”), but I was on tippy-toes. 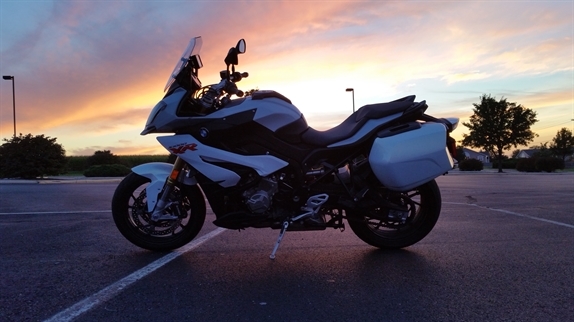 My husband thought I had made an emotional purchase and that I would be better with a 650 GS, but I insisted that I loved my bike and that we were meant to be together. I needed the 800 for the times I would be on the Interstates. Plus, our numbers were the same. She was Alpine white and she was gorgeous. Her name was Stormy. My step-daughter said she looked like a stormtrooper from Star Wars. For a while, a friend of mine nicknamed her Topsy because I dropped her so much. I even dropped her on my test ride. The first thing I did was get riding boots with heels, and that helped tremendously. The second thing I did was go to see John Longo. He makes custom motorcycle seats. Once in his shop, he suggested we just shave some inches off the Sargent seat the previous owner had put on the bike. It was amazing to watch him work. I had to be there because he needed me to get on and off the bike so he could measure where my seat bones hit. Three hours and $200 later, I had a really comfortable lowered seat. I could sit flat-footed on my bike as long as I had heels on. As the weather improved, so did my riding and with that, my confidence. I still dropped her, but not as much. I started writing in my riding log when I didn’t drop her. When it was time for Jim Ford's workshop, I booked a room at a little place in Thurmont, Maryland, close to where we were to meet early Saturday morning. I wanted to be there early. The weather was calling for rain late Friday, but the weekend looked clear. I left late on purpose. I wanted to ride in the rain. I had never done it before and it would only be for an hour and a half. It took me two hours, but I did it and I felt great. After my rain gear was hung in the shower in my little room, I pulled out the pewter flask that I had given Tommy on his 21st birthday and had a celebratory shot. We met at a little parking lot before riding a couple miles to a place to have breakfast, go over the plan for the weekend and begin to get to know each other. There were six of us, including Jim. We rode a total of 525 miles in two days, mostly on what Jim calls invisible roads – back roads where the scenery is incredible, and there are very few cars. With his voice in my head via ear buds, I was able to get real-time feedback on my riding. To this day I can sometimes hear his voice in my head, especially when I start to lose focus and get too close to that double yellow line on a curve. I worked on smooth transitions, lane positioning, the vanishing point, my line, body position, breathing, trusting my gut and so much more. There was a camaraderie that developed, as usually happens in small groups that want to work on improving themselves in any capacity. I dropped my bike once this weekend, in a parking lot. There was one other woman in this group. 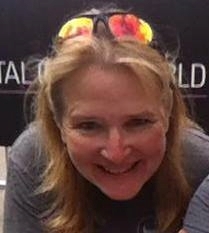 She was from Massachusetts and rode a 700 GS. At dinner that night, we got to know each other a little bit better. She had just lost both of her parents in a private plane crash. Her father was the pilot. They were the only two on board. We were both grieving and healing. Motorcycling was a big part of those processes for us. We also talked about her 700 versus my 800. Jim thought I might be happier with the 700. I listened because my husband thought the same thing, but my gut still said I had the exact bike I needed. The next day we headed to Berkeley Springs, West Virginia, for lunch via more invisible roads. I remember getting into a groove, feeling my bike, my breath, the sun, the universe - all in sync - and then we came out of a corner and in the distance, I could see windmills. The tears came uncontrollably, I could barely see. The last time I saw windmills I was with Tommy. It was March 2012, we were on our way to Joshua Tree National Park. A camping trip, just mother and son. What a gift that trip was. As every detail flooded back and I could not focus on my riding. I was a wreck. Somehow I managed to make it to our stop, I was sobbing at this point, in a full-scale meltdown. The parking lot was iffy and we were all spread out, I was pulled over half on gravel and half on pavement, in a rut and headed uphill. I was so scared I was going to drop her again. Someone in the group had parked and come over to see if I needed help, saw the shape I was in, and asked if I wanted him to park my bike. It was the question I needed. I took a breath, eased out, stood on my pegs and wound my way down and around to a place the others were standing in for me to park. Kickstand down, helmet off, I collapsed into the arms of my comrades, so thankful for them – and thankful I didn’t drop my bike. We had a wonderful lunch, Jim knows where the good food is! We talked more about our riding, what we had accomplished, what we needed to work on, closing thoughts and more. We said our goodbyes, gave our hugs and thanks, and headed our separate ways. As I headed home on Route 340, I practiced all that I learned over the past two days. I eventually practiced everything until it became second nature. While I gained a lot of confidence from the Rider’s Workshop, my bike was still too tall. I looked into lowering my bike. Touratech sold a 50mm lowering kit that I thought would be perfect, but it would void my warranty and there was no guarantee I'd like it. I decided to go test ride a F 700 GS – and I didn’t like it. I can’t tell you why; the suspension was this, the handling was that. I don’t have that much experience. I just didn’t like it. Due diligence done. I wanted to talk with someone who had lowered their bike. Bob’s BMW had done this on one other 800 GS, but the customer moved to Montana. They wouldn't give me his number, but said they would call him and give him my number. Within one minute, my cell phone rang and I was talking with the man who had done what I was thinking about doing. He not only LOVED the Touratech lowering kit, but wished he had done it years ago. In his opinion, not only was he more comfortable on the bike, but it handled better. I made an appointment to have the bike lowered on May 8th, 2014. I rode Stormy home a week later and started planning my first solo trip, to Great Smokey Mountain National Park via Skyline Drive and the Blue Ridge Parkway. S 1000 XR: How did this happen? I admit I love an Italian motorcycle. There are some I can sit at look at for hours, like the MV Agusta F4CC, a Moto Guzzi California and many Ducatis over the years. Someone like me ending up with a BMW is God’s divine intervention, and I chuckle when I say that. For years I was convinced that the Multistrada was the perfect motorcycle for me - with the big exception of its 33.5 inch seat height. When Ducati announced the 2016 specs I was excited. I believe that I was the first one who did not work at Ducati to test ride the demo the day it was assembled. It wasn’t perfect, but it was really good. I eventually put down a deposit and made a deal, a deal that quickly unraveled for a number of reasons. One reason was a seven-day delivery time for a motorcycle currently in stock and on the showroom floor and a minimum of three weeks before the first service. At Indianapolis BMW (also known as Falcone Powersports), Triumph, Indian and Victory are sold by one dealer and Ducati is its own shop in another part of the city. Because I owned a Tiger I had built a great relationship with the BMW/Triumph dealer. Since the deal fell through and it looked like I would be keeping my Tiger for a while longer, I stopped by to make a service appointment. With the most enthusiasm the sales manager could muster, he asked me how the new Duc was. I told him what happened and we began to talk about the low suspension XR. He was sure it would be perfect for me. I vaguely recall a similar conversation, but this time I was more willing to listen. While we were talking, he had someone checking to see when they would take delivery on the next XR. Two weeks was the best estimate and that XR had a standard suspension. What? Seriously? This was early August and the XRs were still trickling into the US. Additionally, this was the Wednesday before MotoGP - a very busy weekend as they are located less than two miles from the track. They had a customer appreciation party and stunt show at the dealership to prepare for. The XR arrived early Thursday, but the rain was relentless that day. I did show up to look at it, sit on it and hear all about its features. On Friday I arrived when the dealership opened; the XR was ready and I asked if I could deviate from the normal test ride route. I needed a bit of interstate to know if I was able to tolerate the vibrations I read about. The XR was more sporty than I expected and I was thrilled. Heavy bar ends would fix any vibration issue. 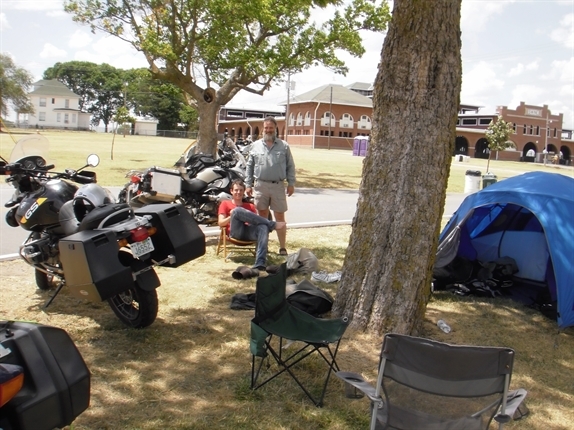 About an hour later I parked my new XR on the backstretch of the Indianapolis Motor Speedway and went to watch the MotoGP events of the day. The first service was scheduled for Tuesday. When I arrived they were eager to hear what I thought about my first 600 miles. The truth is I had been looking for this motorcycle for more than six years. I might have overlooked the XR if it wasn’t for the relationship I had with this dealer. As in any relationship, there are two sides. I show up to make my service appointments. When I work on motorcycles myself, I buy parts from them. They know me, and I know them. In seven days – including the busiest weekend of the year – they found a low suspension XR, had it delivered, sold me the motorcycle and did the first service! I had a similar experience when I purchased the Tiger, and then they had never met me. I also found out they had looked for a low suspension XR when I first started talking about the Ducati, but there was only one in the US at that time. I asked how they pulled this off. They said we just got lucky, a dealer in Michigan had one. They happened to be going to Tennessee the next day to pick up a motorcycle and were driving right through Indianapolis. Sounded to me like divine intervention. I had test ridden more than a dozen motorcycles looking for exactly what the XR is. The perfect amount of sport and just enough touring, and FUN. It is perfect for me. After seven months and 11,000 miles, I am still amazed every time I ride it. Thank you, Indianapolis BMW!